Question re Aristocrat Jr and 40-style Rocket: is there a difference? I can't discern the difference between a 40s style Rocket and an Aristocrat Jr when the 'Jr' has the diamond-shaped base. I know for certain it is a Jr when there is a flat baseplate; there's no issue with that. There seems some controversy over the issue re the other type of Jr, though; as far as I can see, there are different cases and labelling which, as usual, confound the issue, but as to the object itself, I can't clearly make the distinction. Can you? Is it a weight thing? Does anyone have any pictures of both the Junior with the triangular/diamond baseplate and a Rocket which clearly show the difference? Anyone? I know there are two types of Junior with the flat base plate, excluding the aluminium model. One is the 48 (winged centre bar, no end caps) and the 51 or 53, weigh more that the 48, with flat base plate and notched centre bar. There are Juniors that look just like Rockets to me (gap in knob) but they come in cases marked "Aristocrat Junior"
Other than the labelling, is there a difference between this Junior (triangle base plate) and Rockets? There's a thread on the other board where someone says they have different measurements. (01-12-2015, 06:35 AM)insomniac Wrote: There's a thread on the other board where someone says they have different measurements. +1 I haven't tried either razor, so I am not of any help. Hmm, even there there is disagreement. I'm sticking to 'flat base plate' as the distinctive feature of the Aristocrat Junior. I have bought and sold many Rockets. Still wished I had kept the Flaretip Rocket and the HD. But, to your point these two razors are as different as night is to day. I used them both and found the weight, and blade that was exposed made the Aristocrat JR a beast for me, I have dry shin that lends itself to nicks. That flat plate you spoke of adds a ton of weight to this head, you and the blade will become well acquainted with this razor. As for the 40's style, it was a nice shaver. As the English razors go it seemed to shave a bit better than it's American counter part. The mechanisms for the TTO are very smooth, it does not seem to be a big deal until you use one, and one wonders why the American ones could not be like that. As always this is my take and your mileage may vary. Oh after looking at the OP again I see i have missed the jest of the post. If it does not have that flat plate it is not a JR. Let me find the number also. OK here is some info from MTgrayling form another forum that has the differentiate Rocket thread. Also be careful to distinguish the 40's Rockey as we are calling it from the Parat, which is the French version I believe. 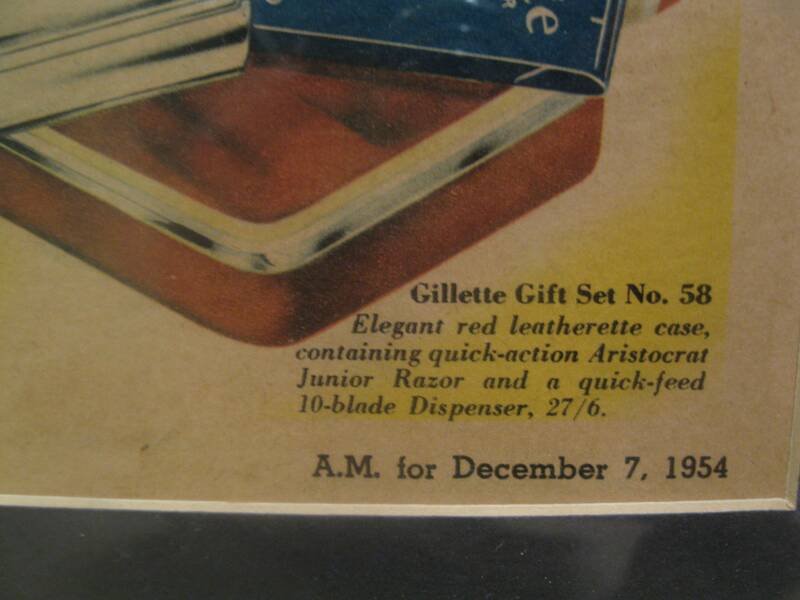 Aristocrat Jr.; this is one of the better built Gillette's in my opinion. It has a heavy 1/8”, 3mm, thick brass plate up top and is like a Rocket in every other way. I’ve heard these called #49 lately. These came in a dark vertical case that says Aristocrat Jr. on the inside. I’ve also heard they were cased in the same red/clear styrene case as the Rocket although I’m somewhat suspicious of these claims. Many people would put their old razor in the new razor case just to house it, or visa-versa. Just try to find the CD you're looking for in the correct case in some peoples collections. BRIT PAT NO 403030 is stamped under head. At 71 grams this is one of the heaviest Rockets. At further reading there seems to be two versions of the JR, let me just post the thread. Ah yes; thanks. I am well-acquainted with the Shave Den link. Most informative indeed, but although there is no specific differentiation made re Rocket and Jr, it is implied by not including the Rocket in the Jr category. I am holding fast to my view that unless it has a flat base-plate, it ain't a Jr, regardless of what the case it comes in states. I am on the hunt for either 51 or a 48. Gillette called the No. 58 an Aristocrat Junior. ...and it most certainly does not have a flat baseplate. The knurling is certainly different than regular Rockets. I know most people assume that the No. 58 is an Aristocrat, when it isn't. (04-20-2016, 02:42 PM)PLANofMAN Wrote: I know most people assume that the No. 58 is an Aristocrat, when it isn't. To be fair, it does have pretty knurling.